Vietnam plans to boost investment in Cambodia with seven new projects worth US$1.32 billion. According to the Association of Vietnamese Investors in Cambodia, the new investment is focused on some key sectors including finance, energy, aviation and telecommunications. 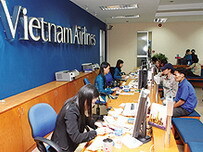 Tran Bac Ha, chairman of the association, said the “wave of investment” into Cambodia started in July 2009 when Cambodia Angkor Air, a joint venture of Vietnam Airlines and the Cambodian government, launched its service. Around that time BIDV, Vietnam’s second-largest lender by assets after Agribank, began operating its branch in Cambodia, he added. According to the association, seven Vietnamese projects worth around $400 million were licensed in Cambodia last year. Previous Vietnamese investment in Cambodia was in very small projects. Speaking at a conference in Siem Reap Sunday, investors requested both governments to promote investment in Cambodia with more preferential policies. Vietnam is now the third largest investor in Cambodia, after China and South Korea, according to a report published by the Vietnam Economic Times Monday.